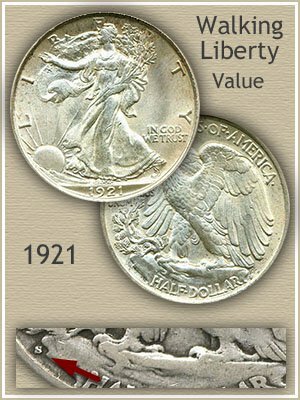 You have a very collectable coin, 1921 half dollar value is higher than most other dates in the Walking Liberty series. Minimum value is $34 for those with the "S" mintmark, indicating the half dollar was produced at the San Francisco mint. Two other mints, Philadelphia and Denver, produced 1921 half dollars. These coins are very rare and worth $85 or more. An image highlighting the mintmark location is just after the value chart. 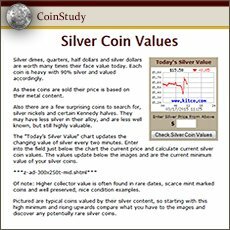 If your coin is in better than average condition its value climbs into the hundreds of dollars, approaching a thousand. With condition playing a huge role it must be judged carefully. For example, conservatively, the value of the 1921 half dollar pictured is above $1800 because of its outstanding condition. Both are covered in detail following the value chart. Mintmarks determine how much your 1921 half dollar is worth. An exciting year in half dollar production, the various mints and high prices. Mints striking your coin were either Philadelphia, San Francisco or Denver. Mintmarks identity the facility, "S" for San Francisco, "D" is the mark of Denver and no mark for Philadelphia. Location of the small mintmark is on the reverse along the rim tucked under the branches in front of the eagle. Few 1921 halves were minted, collectors know few survive until today. It is just fortunate circumstances this coin survives in remarkable condition. It drew the attention of many dealers and serious collectors. Bright white lustrous surfaces, undisturbed since minted is rare. Combined with only minimal abrasions is very rare. Bidding climbed to $9200 as the final price. It became one of the highlights of a David Lawrence Rare Coin Auction and a rarity destined to highlight a Walking Liberty half dollar collection. Remarkable old coins are in great demand today. Many collections are being assembled of high end gem quality examples. When found, dealers and collectors bid aggressively to obtain these seldom available rarities. 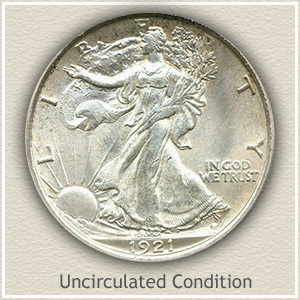 Uncirculated: If your coin was put away long ago before any wear from circulation took place it is in "uncirculated" condition and at the top of 1921 half dollar value. Typically toning has begun to cover parts of the coin, but the original luster is unbroken by wear. Examine Liberty's outstretched arm and rear leg, if the luster is missing because of wear, indicating the coin is circulated, these area appear dull. Fine: As a Walking Liberty half circulates a thin unbroken line with complete loss of detail develops extending from Liberty's head to her foot above the date. Liberty's hand and waist have all merged into one. Such a coin is in "fine" condition. Recognizable are the branches in her arm, and folds in her gown, there is still a depth to Liberty's figure. 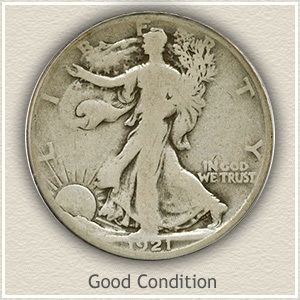 Good: Heavy wear covers the entire surface of your coin in "good" condition. Liberty's left arm has merged with the branches and her waist, the hand no longer visible. Rays extending from the sun have faded, the center ones missing half their length. Turning your attention to the rim it is often just touching the letters. 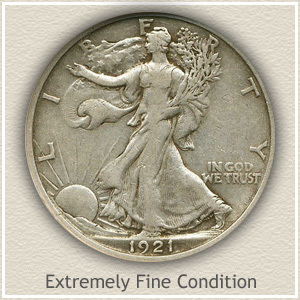 Still desirable to collectors, 1921 half dollar value remains high. Return to Coin Values Discovery... find 1921 half dollar value and... It is an excellent index with images and text links to all coin series, from Cents to Gold. Value charts, grading images and descriptions uncovers the common to rare coin values found in your box of old coins.